Online Advertising KPIs - What should you measure? Clicks, sessions, likes, engagement, conversions, sales, return on ad spend, lifetime value. Online advertisers today have an overflowing variety of metrics available to measure their campaign performance. Various attribution models add to that complexity, creating a never ending discussion of “how should we measure results?”. My goal in this post is to provide you some guidelines and reasons for moving towards revenue and LTV-based optimization, based on how we at Smartly.io see the most successful advertisers around the world answer the question. Old habits tend to stick. Early on, most online advertisers learned to measure advertising performance by clicks on their ads, because that is a reliable and comparable metric to track for any advertising channel. Similarly, early Facebook advertisers adopted an approach to aim for engagement and page likes, as Facebook pages were at first seen as the core of the platform. Clicks and engagement might be good indicators of interest towards your brand, product or service, but are they really making your business any more successful? The way from clicks into more relevant actions is to start measuring the real actions that your company wants customers to take. For many companies that means sales transactions, for others it may be new registrations or new sales leads. This step has already been widely adopted following the cookie-based tracking that is available in most advertising channels, and leveraging the people-based tracking available for Facebook and Instagram advertisers. Actions and especially cost per action (CPA) are very relevant metrics to measure and optimize advertising. 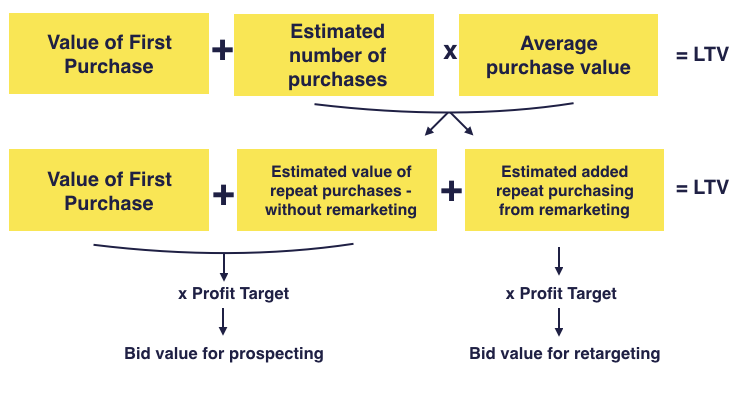 Calculating the profit margin or customer acquisition cost that leads to sustainable growth is at the core of any successful business, so marketing teams often use these numbers as specific targets to aim for. But is that still the ideal approach? Eventually many advertisers learn that despite being very good target metrics, all actions are not equal in value. Not every person who installed your app will buy something from you, and not every person buying from you results in the same amount of revenue that can be translated into expected lifetime value (LTV) and profit. Think of an example: optimizing advertising towards mobile app installs gets you 3 app installs at $4 per install. If moving to revenue-based optimization would bring you 3 app installs at $6 per install, but expected revenue per customer would be two times higher, would you make that change? You should, because a 50% increase in cost per install (CPI) would get you 100% increase in expected revenue. And that’s how you will maximize the business results by optimizing towards LTV instead of actions. The key challenge with revenue or LTV based optimisation is that they are more complex than simply counting actions. Below are some rules of thumb you can adopt to make things easier. Revenue data often suffers from large fluctuations when some customers spend $5 and others $200 in one go. Make sure you have enough data (at least several hundred revenue events) and use robust estimation methods to calculate the mean. If you have enough data, estimate average basket size separately for each target audience and optimize bidding and budgets accordingly. If not, then group more (similar) audiences together, for example all electronics purchasers instead of mobile phone purchasers, and optimize on that. Use a long enough attribution window. Many consumers do not purchase directly after clicking on an ad, causing last click models to miss out on the conversion. Often 1-day or 7-day attribution windows provide more realistic results. You can read more about attribution in this blog post by my colleague Joonatan. Analyze customer lifetime value carefully: how much revenue does the average customer generate in a year or two? How many transactions does it require? How much advertising is needed to re-engage the customer? Again, if possible, do the analysis separately for each target audience. Find early stage indicators of LTV so you can take action faster. For example, does a large first purchase basket size correlate with higher LTV? If yes, you can use changes in average first purchase basket size as an indicator of changing LTV of an audience. Don’t over-engineer. This may sound complex at first but it really isn’t. Aim for a model that is as simple as possible and provides sufficient accuracy that you can work with. See one very simple example below. In the example above, purchase value does not necessarily refer to the revenue generated, but to the real value generated for your company. Often that could be the estimated profit of this conversion before subtracting advertising costs. Did you find this blog post useful? What kind of challenges have you had with tracking and finding the relevant metrics?